Skool Is Out at Barclay Viewforth offers after school care for primary 1-3 children from schools within the local community. The club is situated adjacent to the Meadows’ park, within close proximity to bus services into the city centre. We are registered to take 90 children at the premises, spread across three different rooms – Bruntsfield Hall, Chalmers Hall and Lauriston Room. 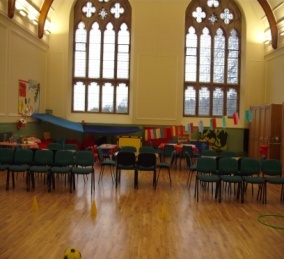 The upper Bruntsfield Hall provides a spacious, warm and bright hall and is the largest of the 3 rooms we utilise, with a capacity of up to 65 children. We can also access the excellent kitchen facilities for the preparation of snack, and this space allows your children the perfect opportunity to participate in baking activities. The Lauriston room downstairs is ideal for art activities, as well as being a perfect space to offer additional classes, workshops and one-off projects. At the beginning of each new school session a dedicated space is set aside for our new primary 1 children when they commence after school club, providing them with their own space to assist them in settling into this new environment.